Info "Check out the spinning silhouette on the top screen, and then tap its match on the Touch Screen!" Profiler is a microgame found in the Touch Training stage in WarioWare: Touched! It is one of the few microgames to use 3D models. The objective of the game is to tap and pick the item that matches the silhouette on top. If this is done, the game is won. However, the game ends in a loss if the time runs out, if the player does not select an item, or if the player selects an incorrect item. 1st level difficulty: There are three objects to choose from. 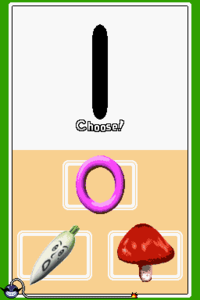 2nd level difficulty: There are three objects, two with similar appearances to choose from. 3rd level difficulty: There are four objects to choose from. This page was last edited on April 6, 2018, at 21:25.